Over the last few years, we have seen the publication of four new translations of the Rigveda, and they have these two things in common; they are pricey and have little advantage over the oldest English translations by Griffith and Wilson that you can download free on the internet. That option is available, but if you are interested in what the Rigveda actually says, you will only find that here at the Rgvedaschool. Here is a list of the four new publications to avoid. The three-volume set edited and translated by Stephanie W. Jamison and Joel P. Brereton was published by South Asia Research and Oxford University Press in May of 2014 and costs a bit more than $400. Stephanie W. Jamison is Professor of Asian Languages and Cultures and of Indo-European Studies at the University of California, Los Angeles, and Joel P. Brereton is Associate Professor of Asian Studies at the University of Texas, Austin, but neither has any expertise in translating the ancient Sanskrit verses of the Rigveda. The Complete Rig Veda by R.L.Kashyap was published by SAKSHI in January 2009, and appears in 12 Volumes (and includes the Sanskrit Text, English Translation and Explanation). Mr. Kashyap is Professor of Electrical and Computer Engineering, Emeritus at Purdue University, USA. He is also the director of the Sri Aurobindo Kapali Sastry Institute of Vedic Culture, so understandably, his English translations are a bit similar to those of Sri Aurobindo, metaphysical, psychological, but far from an accurate rendition of the true teaching of the Veda. The Four Vedas: Mantras in Sanskrit with Transliteration and English Translation is by Swami Satya Prakash Saraswati and Satyakam Vidyalankar. It was published in January of 2011, and is a set of 22 Volumes costing about $300. In this, you will find similarities to the work of Swami Dayananda Saraswati, a favorite of mine along with Sri Aurobindo until I discovered how to translate the Divine Texts of the Rigveda. While this translation might clear up some misconceptions of the Sacred Text, the translation as a whole is poor. The Rig Veda Samhita, Modern English Translation is by Prasanna Chandra Gautam. It is published in four volumes by Bharativa Vidya Bhavan, Mumbai, India and cost about $225. The publisher states that, “this is the first time the whole of the Rig Veda Samhita has been translated in English directly from the Sanskrit Mantras, with each Mantra having first been interpreted by a group of six scholars of distinction. According to the author, there is no similar work, apart from the St. James Bible…” What the author does not know is that the translation of the King James Bible is just as poor as this work, neither of which advances the true teaching of Our Father in Heaven or Mother Goddess. 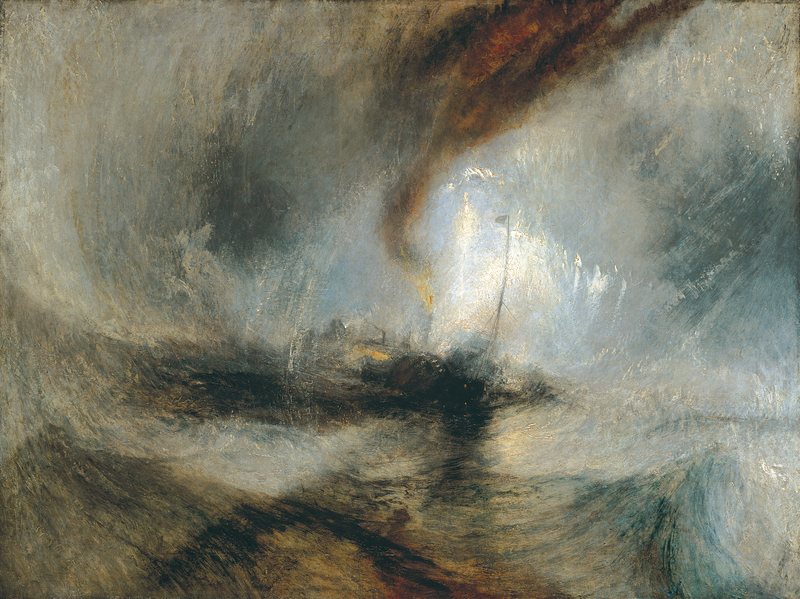 All the new translations of the Rigveda clarify the Sacred Teaching just about as much as the 1842 painting by William Turner called Snow Storm – Steam-Boat off a Harbour’s Mouth. But fortunately, if you are able to read this then you are on the site that advances the Sacred Teaching of the Veda. Please read the many posts and pages of the site, and think about them. I think that if you give it a thorough investigation, you will not find any holes in the philosophy – you will find the doctrine highly probable. Here is a verse from the Veda, and the best of luck to all upon the earth. and go beyond to be immortal.